I gave a show-and-tell (PowerPoint) presentation at the annual luncheon of the South Australian Branch of the PNGAA in Adelaide on 31 October. Jan Kleinig and the Adelaide organising committee asked me to convert it to words and submit it to Una Voce. I intended to recount a number of anecdotes at the Luncheon presentation but an hour spent trying to get a computer to talk to a projector disturbed my equanimity and these tasty bits fled my mind. I now have the opportunity to make good those omissions. I was a pre-WW2 model so I got used to walking everywhere (my family never owned a car so I didn‘t learn to drive till I was 21). My father fought at Tobruk in the 9th Division, 2/13th Battalion ("The Devil's Own"); I reported to all and sundry that my father was a "Rat of the Brook". As a child I read voraciously, especially about New Guinea: Ion Idriess's Gold-Dust and Ashes and Drums of Mer, Frank Clune's Prowling through Papua and Somewhere in New Guinea, Colin Simpson's Adam with Arrows and Adam in Plumes. Four of us (including Mary Mennis, who has written about the peoples and cultures of the Madang Province; eg. A Potted History of Madang, 2006) attended courses at ASOPA in education in Papua New Guinea and teaching English as a foreign language. As no anthropological research had been done at Telefomin, I asked to be posted to the Primary "T" School there. "What?!! You want to go there????" attention of the authorities by his compatriots. It is an interesting story and I have explored it in an essay entitled "The Telefomin Murders: Whose myth?" in the Oceania Monograph 40: Children of Afek (1990). In 1963 the gaoled men returned to Telefomin, two of them to the village where I had chosen to build a house to facilitate anthropological research for myself and my then-wife. I got to know these men fairly well and one of them in particular, Nimisep, became a friend. The administration at Telefomin were a jolly lot. Robin Calcutt was the ADO; John Tierney was the Patrol Officer soon to go on leave with his wife Margaret and son David. John Kelly was a younger PO coming in to take Tierney's place and John Stobart was the Cadet Patrol Officer. There were the usual weekend competitions to see whose pile of beer cans rose the highest: Calcutt had a prodigious capacity and I was the pygmy as I did not acquire a taste for beer till many years later. One day–it was a weekend I think–the two Johns were engaging in some competitive shooting of arrows: more or less straight up in the air to see whose arrows would go highest. I was standing close to the ADO's house and Robin came out to the small balcony off the kitchen and stood with his right leg athwart the balcony rail, pondering (he recounted later) whether he ought to stop these mad fools from doing something that could end in tears. Suddenly, I saw him grab frantically at his right thigh, rush indoors, rush back out, then indoors again, to the accompaniment of much colourful language. Kelly's arrow had got him! I still remember to this day the look on Kelly's face when he realised he'd shot his boss; quite like the expression one imagines on the face of a naughty boy who has just belted a cricket ball through the parson's window pane. But Robin, being the stalwart person he was, took the whole thing in good part and was grateful for the sudden lack of urgency to depart on a gruelling Mianmin patrol the next day. He wondered how he could explain it all to the DO in Wewak without Kelly being found guilty of attempted murder! The Mission people were great sports too: Betty Crouch the Infant Welfare Sister, Don Doull the Baptist pastor and carpenter, and the SIL Linguists, Alan and Phyllis Healey. We were sharing an isolated outpost with sometimes irregular supplies by air and it pulled us together. I know I became quite attuned to the sound of approaching aircraft (though my school students usually heard them before I did) because the plane meant mail and freezer supplies, among other occasional goodies. To this day I am aware of planes overhead, their type and direction. It was the custom that "Steamy's" store in Wewak would try to find a close substitute for anything on your freezer or weekly grocery order that was no-stock. I recall a later ADO's wife having a near nervous breakdown when she opened a parcel expecting lamingtons and found they had been substituted with frozen peas. Apart from the periodic chartered DC3, there was the AMAF Cessna 186 flown by ex-RAAF pilot, Max Meyers (who flew the damn thing like a fighter plane! ), the weird push-pull Cessna, the pugnaciously powerful Piaggio with rear-facing twin engines, and even a Bristol Freighter. All a far cry from the fragile aircraft piloted by Stuart Campbell that landed at the first Telefomin strip built by the Ward Williams gold-seeking expedition in 1936. This was only 22 years after Richard Thurnwald had struggled up the Sepik to Telefomin to be the first white man to enter the highlands of the island of New Guinea, and only ten years after Karius and Champion camped there on their historic patrol across New Guinea from the Fly to the Sepik. Binengim, a charming old man from the Telefol village of Derolengdam, was in his early teens when Thurnwald arrived in 1914. He told me he traded some food for a small knife but at first he did not know what it was for. He had to be shown. In 1962, the Primary "T" School consisted of a single building divided into two classrooms and a small office and there was a small cottage for the Tolai assistant teacher. With a bit of creative accounting and by sourcing local timber from the Baptist Mission sawmill instead of having it flown in, Robin had managed a loaves and fishes outcome to infrastructure development. A couple of "native materials" huts nearby housed the boarders from more distant tribal groups, fed by locally purchased taro and kaukau nominally for the station's "labour line". Amazingly, the classroom and teacher's house were still standing when I visited Telefomin in 2002, supplemented by additional buildings and a quite large High School half a click away. Some Vanimo parents had wangled jobs at Telefomin so they could send their kids to the Telefomin High School rather than to the Vanimo High School, as there are no roads in to Telefomin and therefore no raskols! Although I was trained in social anthropology, I did not find the kinship-and-marriage thing particularly engrossing. Instead, an interest in material culture was inspired by Bryan Cranstone, then of the British Museum, who came to Telefomin in 1963 to make a collection in a nearby valley for his museum. I helped him with introductions, logistics and learning tok pisin, and became very interested in what he was doing. The Telefolmin and other nearby tribes had carved and painted boards on the front of their houses and I had never really noticed them before. I ended up doing an almost complete survey of houseboards and war shields in the whole region and came up with enough material to write a Master's thesis at the University of Sydney in 1969. The Australian Museum got a comprehensive collection of material culture out of me as well. I took lots of photographs too, and admired the engineering skills of these stocky mountain people who built impressive suspension bridges across wide rivers and truss bridges to span narrow gorges, all secured by rattan. I was privileged to see the last of the initiation rituals of the Telefol. During my brief visit to Telefomin in 2002, I was greatly saddened to note the destruction of the pan-tribal ritual temple at Telefolip by fanatical expatriate-inspired evangelical Christians. There was a deep sense of loss among the few surviving traditionalists. This was not something that the Baptist pastor Don Doull or the SIL linguists Alan and Phyllis Healey would have condoned. Apart from a few exploratory trips to nearby valleys with some of my older students, the most exciting adventure was my participation in the Australian Star Mountains Expedition of 1965. A planned British caving expedition to the Star Mountains didn‘t eventuate and evolved into an Australian caving expedition. I was asked for advice on logistics and so inevitably I was keen to participate. The Star Mountains were tantalisingly just visible from Telefomin on a clear day. I read the report of Des Fitzer's 1963 patrol which walked from Kiunga to the Star Mountains but fell short of climbing to the 3000 metre plateau because of the large number of carriers and police and insufficient local food to feed them all. I devised a plan where each of the five participants would carry his own backpack (20-25 kg) and we would rely on just 16 full-time Telefolmin carriers and one Tifalmin doubling as an interpreter. As needed, we would enrol local people to carry from one camp to the next. I identified routes in and out using the Border Special maps and aerial photographs provided by Defence in Wewak who, of course, were interested in terrain data and track times. 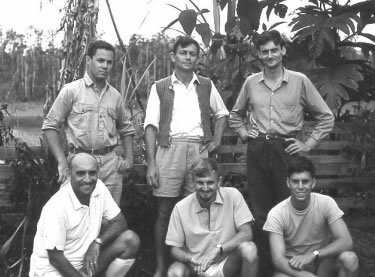 The members of the Expedition, apart from myself intending to collect anthropological and linguistic information, and plant and herpetological specimens, were Tom Hayllar, an eccentric school teacher and caver from Sydney; David Cook, a geologist who had been working at Mt Isa; Mike Shepherd who was a University of Sydney student looking for evidence of glaciation; and Paul Symons, a clinical psychologist and a caver, who later joined the Territory service as regional psychologist at Lae, then became Burton-Bradley's second in Port Moresby, retiring in the early 1980s. A sixth person was not really a member of the Expedition but attached himself to us. This was John Huon de Navrancourt, a big blustering Frenchman who had fought with the French underground in WW2 and recipient of the Legion d'Honneur, who had recently arrived at Telefomin as Medical Assistant. He walked in independently to join us for a health survey at our first base camp south of the Star Mountains, then departed for Telefomin just before we moved up into the Star Mountains, assuring us he would continue to "assist" the expedition by throwing out the airdrop bags over our Plateau base camp. His "assistance" went pear-shaped. The Piaggio was streaking across a marked area of Plateau about a hundred feet above the ground, Huon ejecting bags. But at the end of the second run it seemed suddenly to lurch awkwardly, one engine sputtering, lose height and head for a mountain it had easily cleared on the first run. When it looked like a crash was imminent, the engine refired, the plane just made it over the mountain and it disappeared with most of the airdrop still on board. What had been dropped were caving ladders, boots and the like: nothing to eat! Wild dog was on the menu the next day. Frantic radio messages revealed the scenario. John had gone forward to say something to the pilot and, being French and a dedicated extrovert, his gesticulations came into unfortunate contact with one of the main engine levers above the pilot's head. The pilot managed to flick the lever back on and, convinced he had a lunatic on board, shaped a course straight back to Telefomin. Subsequent drops were done from a thousand feet and sans Huon. We set up three base camps in all and from each we explored the surrounding country for a few weeks. At each we arranged for airdrops signalled by a tiny radio. One airdrop bag was opened and we found a bottle of rum and a few other goodies had survived the drop, but we hadn't ordered these items. It turned out that they were meant for the patrol officer at Oksapmin, in the exact opposite direction from Telefomin. He generously donated them to the expedition when he learned what had happened to his outpost comforts. Our time in among the peaks of Capella and Scorpion was magical but nearly the death of me. I was walking along with a full pack, heading back to our camp that was perched behind the ridge overlooking the Busilmin settlements on the north fall, when I slipped into a deep crevasse in the limestone. As I fell I grabbed at a tree root and it held but I dislodged a stone that hit me on the knee cap where I had a developing ulceration and the pain was excruciating. We were spread out along the track and no one saw me fall and probably would not have heard me if I had called out. Somehow I managed to pull myself out and reckon on another of my nine lives gone. Our walk in along the south side of the mountains took us just a few kilometres north of the Ok Tedi "Pot of Gold" so, despite having a geologist along with us, we missed The Big One. But three months out in that magnificent country was reward enough, especially the view west from Scorpion fifty kilometres to the snow cap of Juliana, and the view north from over 4000 metres ASL over the lowlands of Green River, beyond to the Border Mountains and to the Bewani Range on the horizon, some 200 kilometres away (see Gallery: Photosets: Star Mountains on www.uscngp.com). There is possibly a book in that part of my story alone. Even the rather dry account of the 1959 Dutch expedition to the Star Mountains of [West] Papua (Brongersma and Venema, 1962, To the Mountains of the Stars) is fascinating reading for a New Guinea hand. So what of my "Last Frontier"? Of course, others had preceded me but there were nooks and crannies still left to explore, people to meet and cultures to discover. In subsequent years I spent months walking through central New Guinea, the upper Sepik and the Border Mountains collecting for museums; in 1972-73 a year in the Idam valley south of Green River; in 1980-83 as Curator of Anthropology at the PNG National Museum which enabled me to extend my experience down the length of the Sepik River, and to New Ireland and New Britain; and in 1993 and 2002 again to the Bismarcks but also to the Lumi-Anguganak area. If we did not find gold in the Star Mountains, some of us fell under the spell of "New Guinea fever". Perhaps with malaria, the mossies inject also a love of the country and a vast respect for the people and the unparalleled variety of languages and cultures. My first experience of any culture outside of Australia was with the Telefolmin, who struck me as a rather dour and reticent lot of whom a morally-conservative Protestant work ethic seemed entirely apt but who in time became firm friends with their own laconic sense of humour. before the broad bamboo blade….